We spoke briefly yesterday about the already-record breaking Veronica Mars movie Kickstarter, but that post was mostly to express our unbridled enthusiasm, our uncontrollable excitement about the possibility and then certainty of a return to Neptune. However, it would be irresponsible of us to talk about this revival, and convey our joy, without considering the very real ramifications of this money-making endeavor. The Veronica Mars movie, having already surpassed its $2 million goal by $1.3 million, has completely changed the paradigm for what a Kickstarter can be, and, certainly, raises the question of what it should be. The obvious issue with this fundraising format is that Veronica Mars fans – you, me, Steve, Tom – are essentially not only paying for the production of the movie, and not only paying for the production of the movie so Warner Bros. doesn’t have to, but we’re paying for the production of the movie so Warner Bros. doesn’t have to and handing them the profits. There’s no backend deal here, there’s no recouping on our initial investment. We will not be entitled to any portion of the net. Meanwhile, while we pour our millions of dollars, perhaps contributing a significant portion of our incomes, spending money we really don’t have, a giant movie studio will reap the benefits. It’s easy to think – and very pragmatic to do so – that they have hundreds of millions of dollars to sink into the Harry Potter franchise, and then they have hundreds of million dollars to extract from the Harry Potter franchise, and they can’t fork over a measly two million for this little passion project? That’s not necessarily a cynical, misguided outlook. But it also doesn’t paint an accurate picture. Tagged as Harry Potter, Kickstarter, Neptune, Red Cross, Rob Thomas, Syria, Veronica Mars, Veronica Mars Movie, Warner Bros.
We’ve spent a lot of time over the past week discussing the Summer Olympics and with last night’s Closing Circus Ceremonies in London we could spend a few hundred more words deriding the final festivities – and such chastising would be much deserved – but we think we did enough of that on Twitter. Instead, we’d like to spend our respective closing ceremony considering the female athlete in the United States, and we’d like to do so, in unorthodox fashion, with the minimum amount of snark. 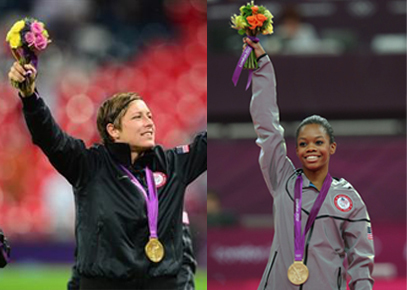 During these 2012 Olympic Games we couldn’t help but be struck by the sheer dominance of the USA women – from gymnastics to swimming to soccer to beach volleyball to basketball – and how much our females have moved to the forefront of international competition. Indeed, we heard a fact – perhaps it was from Bob Costas, the Walter Cronkite of the Olympics – that if the United States women comprised a separate country they would place third in the gold medal count. Third. Which is a stunning stat, and should motivate the men (with a few exceptions, including Michael Phelps, David Boudia and the men’s basketball team) to extend a hearty thank you and congratulations and maybe even get down on their knees and propose. But beyond the magnitude of their achievement, the success of the USA women got us thinking about the state of women’s sports in America, how we got here, where it’s going, and, most especially, which female gold medalist do little girls today want to be when they grow up. The Ultimate Eugene Levy in ‘American Pie’ Showdown – FINALS! Well, after what could only be described as a bloodbath, a display of violence so grotesque it rivals the Mortal Kombat tournaments, only two Eugene Levys are left standing in our Ultimate Eugene Levy in American Pie Showdown: the old guard, the wily veteran, Jim’s Dad in American Pie, and the new kid on the block, the upper and comer but still older and wiser, Jim’s Dad in American Reunion. It’s not just a clash of titans, it’s a clash of generations, a clash of millennia. For over a decade Jim’s Dad in the original American Pie has been known as the preeminent Jim’s Dad in American Pie, but Jim’s Dad in American Reunion is looking to change all that. Two Jim’s Dads in American Pie will go in, but only one Jim’s Dad in American Pie will come out. The finals start…right now! Vote early and vote often. Keeping with today’s theme, we’re going to address the recent rumblings about Queen Latifah’s sexuality. Last month word spread across the blogosphere that Queen Latifah declared herself a lesbian at the Long Beach Pride Festival on May 19th. But she later denied those reports, explaining that her unity with the gay community does not necessarily equate with her coming out of the closet, and she refuses to comment further either way. And we respect her feelings on the matter and her preference to keep her private life private. But we don’t care either way; you be you, Queen. What do know, however, is that the girl can play ball, for whatever that’s worth. Take a look at this classic highlight from the 1994 MTV Rock’n’Jock B-Ball Jam and draw your own conclusions. Or don’t. Or do and keep them to yourself. That’s your right too. The Ultimate Eugene Levy in ‘American Pie’ Showdown – Round 2! 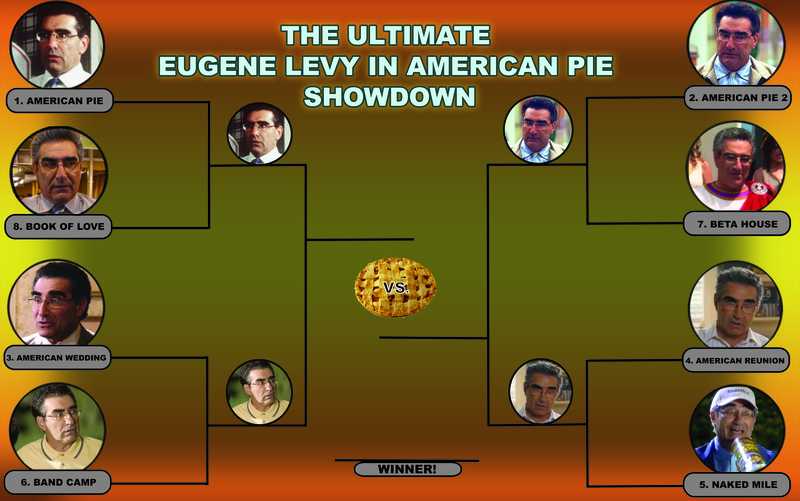 The Final Four in the Ultimate Eugene Levy in American Pie Showdown is set! Following an explosive, dramatic, electric opening round we’re left with Jim’s Dad in American Pie, Jim’s Dad in American Pie 2, Jim’s Dad in American Reunion (a controversial win over Jim’s Dad in American Pie: The Naked Mile), and, in a stunning upset, Jim’s Dad in American Pie: Band Camp. Can the number six seed continue its cinderella run and shock the world by taking down the original Jim’s Dad? Will the older, wiser Jim’s Dad in American Reunion be able to overcome his younger, more agile, less gray self? The only thing that we know for sure is that when it comes to Eugene Levy as Jim’s Dad tournaments anything can happen. Is ABC’s ‘The Neighbors’ Actually a ‘Meego’ Spin-Off? The Neighbors: The series, set in New Jersey, revolves around a gated townhouse community called “Hidden Hills.” This is where the Weavers (Lenny Venito & Jami Gertz), a normal average family, have decided to move to. But upon their relocation to this community they discover that this place is populated by residents who are actually from another planet, using names of sports athletes, where men can become pregnant, receive nourishment through their eyes and mind by reading books rather than eating, and cries out green goo from their ears. Not only that, it appears that these aliens have been stuck on Earth for 10 years, still awaiting for a distress signal to return home. Meego: Meego (Pinchot) is a 9,000-year-old shape-shifting alien from the planet Marmazon 4.0. After his spaceship crashes, he is discovered by three children; Trip, Maggie, and Alex Parker (Will Estes, Michelle Trachtenberg AND Jonathan Lipnicki) . They live with their single father, Dr. Edward Parker (Ed Begley, Jr.!) and pass Meego off as human (he tells people he is from Canada). Although he plans to go home as soon as his ship is repaired, he becomes attached to the children and decides to remain on Earth to care for them. The latter show was specifically created for the CBS Block Party, their attempt to topple ABC’s TGIF after picking up both Family Matters and Step by Step from the Disney network. Pinchot himself was coming off of a short stint on Step by Step as beautician Jean-Luc Rieupeyroux, which followed, of course, his long run as Balki Bartokomous on original TGIF member Perfect Strangers. While The Neighbors will air on Wednesday nights, not Fridays, it could have easily fit on that popular comedy lineup, and perhaps that’s where it will eventually end up, considering the statement from ABC Entertainment President Paul Lee that ““It’s time for Friday night to be a destination again for broad family entertainment.” May not be long until The Neighbors slides into Meego‘s old Friday at 8:30pm time slot. Is it possible that residents of Hidden Hills are from the plant Marmazon 4.0? Why not? They all seem to have things coming out of their ears. (and, yes, we realize that Meego is basically Mr. Belevedere with an alien. Or Free Spirit with an alien. Or Who’s the Boss? with an alien. Or countless other shows with an alien). Earlier this month we saw the release of the eighth installment in the American Pie franchise, American Reunion, and Eugene Levy holds the noble distinction of being the only actor to appear in the four theatrical films and also in the four straight-to-DVD movies. Thirteen years into his lifetime contract as “Jim’s Dad,” we thought it was time to pit all the Jim’s Dads together in a definitive tournament to decide which is the greatest Eugene Levy as Jim’s Dad in an American Pie movie of all time. No surprise, Jim’s Dad in the original Pie is the number one seed, but, just like we’ve seen in the NHL playoffs, anything can happen and nothing can be taken for granted. Take a look at the opening round and cast your vote now. Who said there can’t be madness in April?